Diversification is the “only free lunch in investing”, and I love it. However, I came to the conclusion as I started tracking my investment performance rigorously that I had overdone it. Since that realisation I have been rowing back slightly. I appraised my progress recently, and this rather dry blog post sets out my findings. I track all my investment portfolio holdings in one single investment spreadsheet. One advantage of this approach is that I have a consolidated view of my portfolio which ‘de-dupes’, and makes it fairly easy to see large positions that amass when I buy the same ETF in multiple portfolios. What is the appropriate number of holdings to diversity accurately? You’ll find as many answers as responders to that question. But consensus seems to suggest 20 holdings is more than sufficient, especially if you are using collective securities such as index funds or ETFs. When I began my unified tracking I had no fewer than, erm, 228 holdings. Over two hundred holdings. Almost every single one of my holdings I have personally chosen. With a reasonable amount of consideration, time and of course fees associated. Multiply this by 228 and pretty soon it sounds like a lot of time wasted. How did I end up with 228 holdings? 29 ETFs. Of these 29 (15%) of them were ETFs, amounting to just over 30% of the total portfolio value. VUKE was originally my largest, at just under 10% of my total portfolio; these days IUSA is my biggest, with about 5% of my portfolio. 57 Funds. Ouch. This was a testament to having used my fair share of IFAs and private bankers over the years. This lot added up to around 25% of my portfolio’s value. The largest holding was about 2% of the total. 122 equities. Half my holdings are directly held equities. They amount to about a third of my total portfolio value. They included, originally, 57 holdings of less than £10k each. 12 bonds. Individually held bonds are quite exotic things really so no wonder I don’t have many. Though my largest is 2% of my portfolio, the total amounts to only 5%. 8 cash equivalents. Eight! Five separate currencies, held in 8 different ways in total. Higher transaction fees. My minimum opening position used to be around £1000. At this level I am doing a lot of transactions and my in/out fee is over 2% even before stamp duty. With a higher average trading amount I cut my fees. Higher paperwork/admin time. Almost every single one of my holdings spits out income payments. I track many of these individually. Typing in £0.31 of tax credit on a Fidelity account for some <£2000 holding is not good use of time. Reduced mindshare. Warren Buffett has long espoused the ‘20 punch card‘ approach. He has a point. His point is choose wisely, and get it right – and limiting yourself to fewer bigger decisions improves your odds. And of course to stay up to date with 20 investments is far easier than keeping tabs on 228 investments. Carrying deadweights. Looking back at my 5 year old portfolio I recognise holdings that I knew were suspect, but I ducked the challenge of making a decision to liquidate them. 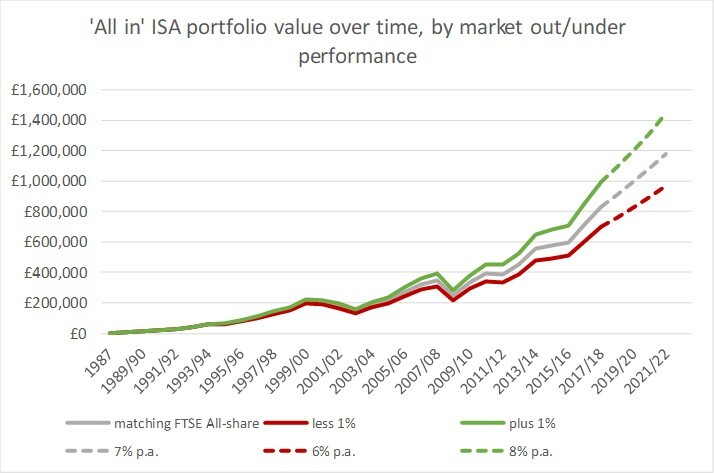 When they’re small, the damage they are doing to the portfolio doesn’t feel worth the bother. Diluting my best picks. Some of my best performing investments have been my smallest. I have had a hunch, and invested £2k, £5k, or something similar. If I’d made my entry ticket bigger, and adopted a different approach to selling out duds, I think I’d have made more money without taking on appreciably more risk.